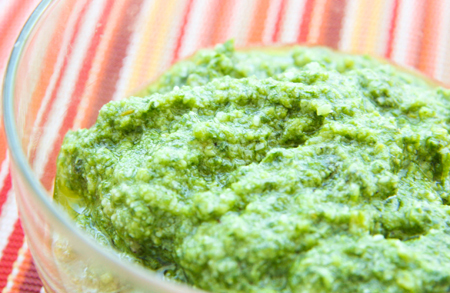 Spinach basil pesto — Pip and Ebby - easy, delicious recipes! So, so, so very tasty you will be sure to eat every last bite! Delicious with so many different foods. My husband has a knack for buying the most perfect gifts without ever having to ask me what I want. He keeps his ears open and logs everything in the back of his brain for later use. Smart man, don't you think? Without fail, I am genuinely surprised upon opening at least one Christmas gift and one birthday gift every year. He's mine, you can't have him! Because of all of the insane cooking and food photography I do these days, my thoughtful husband knew that I might enjoy a fun new kitchen toy. I mentioned wanting to make some holiday hummus recipes a while back, and lightly lamented about not owning a food processor. A week later, as he stood in the kitchen making dinner, he said to me, "Will you go peek in storage and let me know if we have any toilet paper? You know, the soft kind?" What the...?? Being in the tired fog that encumbers most of my sleepless life as of late, I opened the door leading into our storage room to look for TP for my husband. Who was cooking. And what do you think I found? A shiny new food processor, of course! EEEEeeeeeeee!!!!! Jumping, squealing, clapping and high-fiving all followed. 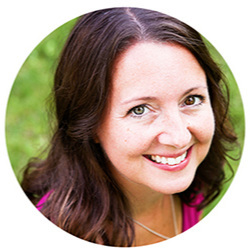 And then I sat down to write out my list of Food Processor-Related Recipes To Make! 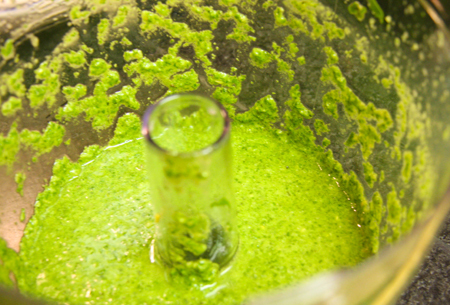 This pesto recipe was one of the first foods to meet my new toy, and it is so. so. so. very. tasty. We tried it in/with so many different foods, and it did not last long at all. We wiped every single smudge of green from that bowl. 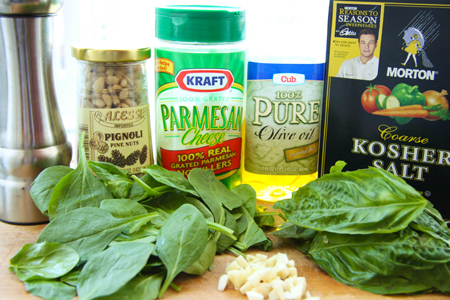 Throw the basil, garlic and pine nuts into a food processor. With the food processor running, gradually add the olive oil and process until smooth. Transfer to a bowl and stir in the Parmesan cheese. Season with salt and black pepper. Replace basil with 1 cup fresh parsley, 2 tablespoons of fresh rosemary leaves and 2 tablespoons of fresh thyme. Substitute walnuts for pine nuts if you don't want to spend FIFTEEN DOLLARS on a tiny jar. 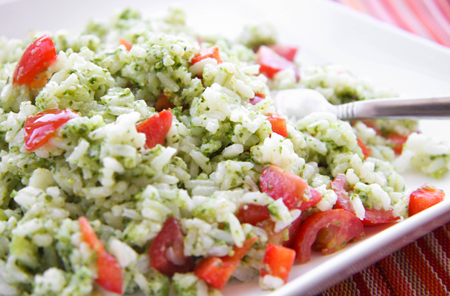 Ebby had mentioned to me that she loved adding pesto to rice, so I gave this a try. I added to it: chopped red bell pepper, chopped tomatoes and chopped jalapeno peppers. It was FANTASTIC! I made this at 10:00 in the morning, and it was gone by 10:15. Nice. I threw a few spoonfuls of pesto into cooked spagetti the following morning, for another mid-morning snack, along with chopped tomatoes and a sprinkling of black pepper. Again, FANTASTIC. And then for lunch that same day, because by this time I was a complete pesto addict, I made this delicious pesto crab grilled cheese sandwich. And that night, guess what?! More pesto! Wooooo! We used it as a dip for cubed, cooked venison steaks, veggies and pita bread. And by that time, our pesto bowl was empty, sides licked clean and all. Please share your own pesto recipes/uses! Good until the very last bite! Don't be afraid to try it with a wide variety of foods! Place basil, garlic and pine nuts into a food processor and pulse until coarsely chopped. With food processor running, gradually add olive oil and process until smooth. Transfer to a bowl and stir in Parmesan cheese. Season with salt and black pepper. Alternatives: Replace basil with 1 cup fresh parsley, 2 tablespoons fresh rosemary leaves and 2 tablespoons fresh thyme. Substitute walnuts for pine nuts.